This week I’m interviewing Nicola May, successful self-published chick lit author of Star Fish, Working It Out and Better Together. Nicola embarked on her self-publishing journey by bringing out her first two novels in paperback. This is what she has to say about her experience so far. You’ve self-published three novels: Working It Out, Better Together and Star Fish. Firstly, what led you to self-publish, and secondly, what led you to self-publish in paperback as opposed to in ebook format? I tried for years to get published in the traditional way. I even had a reputable agent at one stage but it is very hard to get a publishing deal. It wasn’t until I got a letter from Hodder saying they hoped it wasn’t a big regret turning me down that I knew I was good enough to get my writing out to the wider world. My dream was always to write a book that people could hold and read and I could see it on a bookshelf. Even now if I saw someone reading my book on a train I might faint with excitement. It hasn’t happened yet! I think that avid readers do still like to hold an actual book in their hands and the face-to-face contact at launches, signings etc is good for word-of-mouth marketing. Being honest and I hate to say it out loud, it is actually far more cost effective to sell electronically only as overheads are minimal. I do see lots of authors following this route. My third novel Better Together has outsold both of my other novels on the Kindle as I haven’t printed this one. I am going to put my fourth novel in print due to popular demand from my readers but only a small run initially. I will of course put it on the Kindle too as it would be stupid not to. What haven’t I done to market my books! 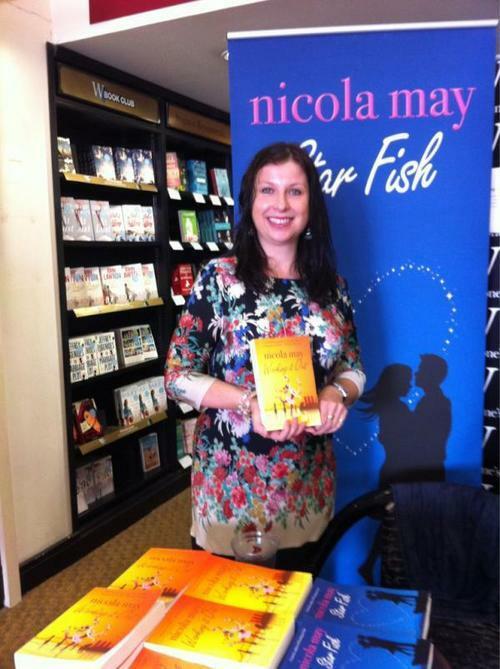 I have an author website (www.nicolamay.com), Facebook page (Nicola May) and Twitter account @nicolamay1. I have done local radio interviews talking about my self-publishing story and have had various articles in local papers, plus in WOMAN magazine. Star Fish was also hot read of the week in WOMAN magazine earlier this year. Plus, it has a full-page review in Horoscope magazine this month. I constantly sign at various Waterstones stores and get involved in local craft fairs and festivals. What has self-publishing taught you about the publishing industry? That it’s a hard industry to succeed in. Unless you have a bestseller you are not going to earn life-changing money and constant marketing is a must. What would your top tips be to anyone contemplating self-publishing? Be prepared to work VERY hard. Everyone aspires to be the next J.K. Rowling but it ain’t that easy. You and your books are a brand and successful, constant marketing is key to your success. Be nice to everyone you meet along the way. Keep writing and most importantly, be BOLD! Are you working on a new novel? If so, when will we be able to buy it? I am indeed, it is entitled The School Gates and I’m half way through. I am aiming for an autumn release. I haven’t got an exact date yet but follow me on Twitter and I will give regular updates. This is an exclusive book blurb just for you and your readers! When Yummy Mummy Alana reveals the identity of her lovechild’s father, she doesn’t expect the consequences to be quite so extreme. Ex Czech au-pair Earth Mummy Dana finds happiness in her secret sideline, but really all she longs for is another child. Slummy Mummy Mo’s wife-beating husband leads her down a path she never thought possible, and Super Mummy Joan has to cope when life deals her a devastating blow. And what of Gay Daddy Gordon? Will he be able to juggle parenthood and cope with his broken heart at the same time? This entry was posted in Author interviews and tagged ebooks, kindle, literary agent, nicola may, publishing deal, self-publishing by Tasha Harrison. Bookmark the permalink.